That second “F” could stand for a lot of things — finally, flipping, freaking…you get the idea. This has been one jam-packed week. Last night was my first night home all week and so I celebrated by making trying to make a really nice meal – Pad Thai. Fail. It all went into the trash. The sauce was the consistency (and color!) of tar and there was just sooo much of it. The meal was completely ruined (and I followed the recipe to a T!). And an hour of my “free” evening was wasted. Not only that, but…now what’s for dinner, right?! Heat oven to 375 F. Combine strawberries and rhubarb in an oven safe dish. Add agave nectar, orange juice, and orange zest. Next, sprinkle with cornstarch and toss until fruit is well coated. Set aside. Mix remaining ingredients for the topping in a medium bowl then spread over fruit. Bake until topping is golden brown and fruit is bubbling, about 40 minutes. Yield: 8 servings. 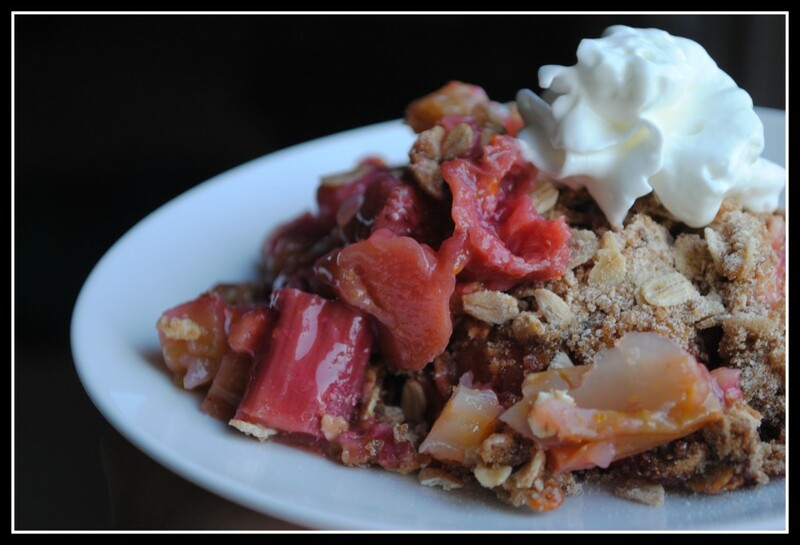 Result: If you love rhubarb, this is a must-make recipe! 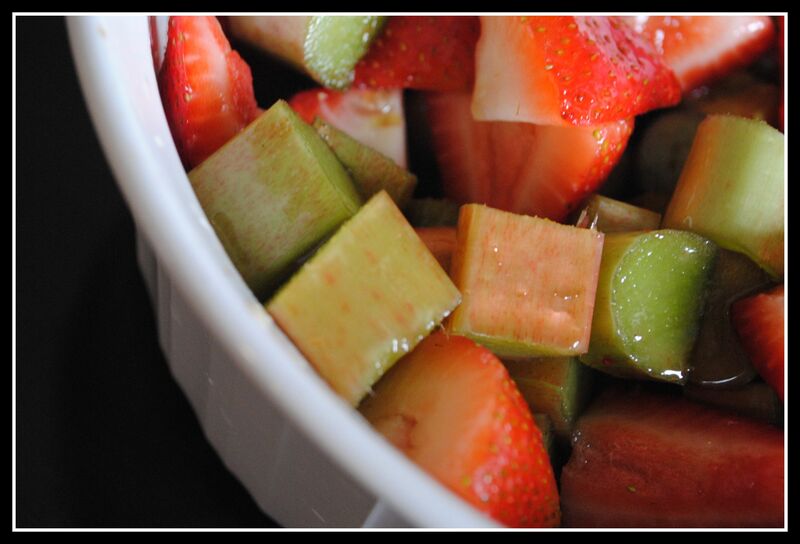 The fruit gets soft and the strawberries help to sweeten the rhubarb, along with the agave and sugar 🙂 This is the perfect treat for the timely rhubarb season and comes together in about 10 minutes. 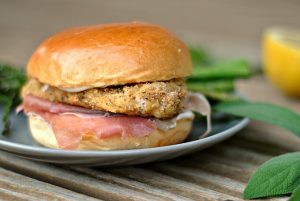 Delicious – enjoy! Question: Would you have assumed rhubarb to be a fruit or vegetable? P.S. Don’t forget to enter my blogiversary giveaway by 10pm EST tonight for a chance to win a doughnut pan, food scale, stevia products, or Larabars! I have a word for the second “F” and it’s not “freaking”. Yep. It’s been a long week! Do you know I’ve NEVER cooked with rhubarb? I always want to– I stare longingly at it at the farmers’ market, but then I get intimidated and never buy any!! OH I hate it when recipes are failures. Thank goodness for the pork carnitas, YUM! And I love love love rhubarb, but have never used it in cooking. Whil eI think it’s a fruit, since it’s always paired with fruit and used in fruit pies, I’m going to take a stab at this and say it’s a vegetable. Glad your LONG week is over, Nicole!! I hope next week is a little bit less stressful. Hmmm… I’m not sure if I’ve ever had rubarb. I would have guessed veggie only because it looks like celery. I cant wait to hear the winners or your giveaway! I want to win SO bad!! This dessert looks incredible! 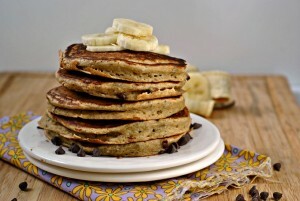 I seriously hope to make this soon! Need to get some rhubabr asap! Good luck on your duathalon. You’ll do great! I had a similiar experience a few months back when I attempted homemade pad thai. I HATE when meals turn out badly. Throwing away food breaks my heart. Mainly because Im poor and I always try and calculate how much money I just wasted. I can never figure it out though – thats probably a good thing. The strawberry rhubarb crisp sounds amazing though. My mom had a rhubarb plant at our old house, and we used to have strawberry rhubarb pie ALL the time – she never made a crisp out of it though. Thats a way better idea. I was so bummed when I missed making rhubarb last year — must get on this before the season is over! OMG Nicole, I’ve had so many meals like that happen to me, and I usually throw the whole thing DISH INCLUDED in the trash because I get so pissed. Hooray for dessert though! I have never in my life had rhubarb, hope to find some this weekend as I think my hubs does like it. Happy Friday and good luck on Sunday – look forward to the recap! Oh my word, I need to pick up some rhubarb. 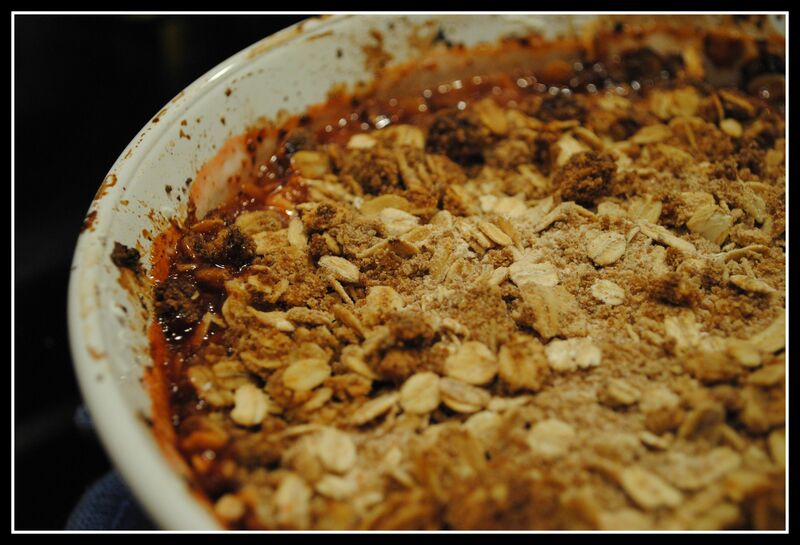 I love strawberry rhubarb crisp in the summer!! Big DARN about the pad thai disaster!! (too bad you don’t have one of those really UGLY troll mascots that I’ve used on my blog on occasion – they make the worst looking meal beautiful because they are SOOOO ugly themselves! 🙂 ) LOVE LOVE Rhubarb! This looks sooo good. I must remember to pick a few bundles of it up on the weekend, chop it up and throw it in the freezer. Have a great Friday Nicole!!! PS: Good luck in the race on Sunday!!!!!!!! That looks delicious! I knew rhubarb was a veggie, but it works so much better in dessert. 🙂 I’m having strawberry rhubarb pie for my birthday dessert this weekend made out of ingredients from my mom’s garden and I can’t wait! I’m getting rhubarb in my first CSA on Monday! This looks like the perfect way to enjoy it! Good luck this weekend love! I know you’re gonna rock it! Sorry about your fail. I had a baking fail last week. First batch – fail. Second batch – fail. Third batch – gosh dang darnit there’s no more butter!!! And I quit. 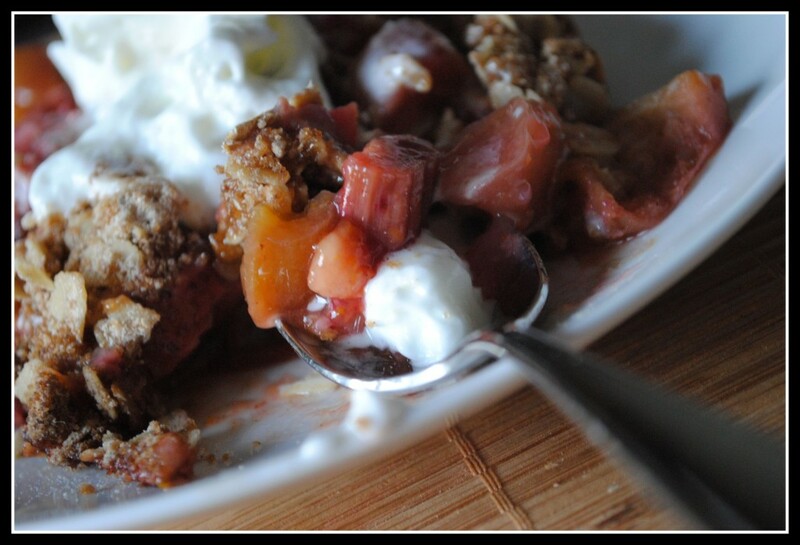 As for rhubarb – yum yum yum! Reminds me of my moms garden when I was young. Love anything rhubarb. And random fact – did you know that rhubarb leaves are poisonous? Only the stem is edible!